Remember my post a month or two ago about my hatred for raisins? Then I said my one exception is pickled golden raisins? Seems like a strange exception, and this recipe is the reason. This particular recipe is a homemade version one of the best vegetarian dishes I have ever eaten, and of course it was at Longman & Eagle. Their cauliflower entrée is so amazing that I could not even strongly object to the raisins in it. However, when I tried to make it at home, I found that pickling the raisins made it even better. I am not sure if they do this in the original recipe as it's not published anywhere, I also don't remember exactly what every component tasted like, but I have a version that my home-cooking self is happy with. I'm always amazed at the complexity of flavors and textures that professional chefs can create. Here I am, someone who can't think of much else better than a homey chicken pot pie. Then you have someone like Jared Wentworth and the chefs of L&E who can bring so many components into a perfect plate. I don't think I have ever been disappointed in anything I've ordered there (and I have tried no small amount of their menu, back when I lived in Chicago at least)...wait, I take that back, I think once I got a risotto that was a smidge undercooked. I still ate it all, that is how good the flavors were. Consider this the first in an installment of recipes honoring my favorite restaurant in Chicago. I'm not sure when the other ones will roll around as making replicas of their food is quite a production, but enjoy this one for now! This recipe takes a while to make, there are a lot of components and slow roasting the cauliflower is the key to bring out it's sweetness. 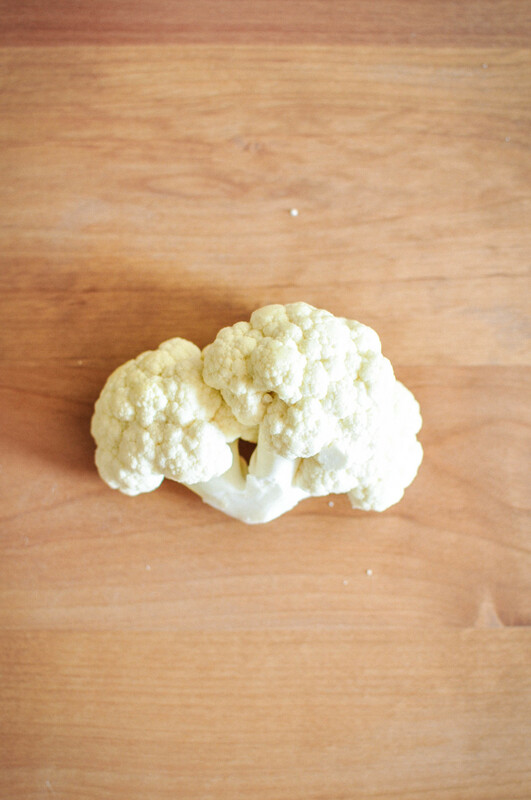 I must emphasize that the cauliflower takes 3 hours to roast (in case you were planning on making this as a weeknight dinner and hadn't skimmed through all of the instructions yet), plan ahead and deliciousness will await you! Place mangos and raisins in two separate 8 oz jars. In a small saucepan, bring vinegar, water, sugar, garlic, and salt to a simmer over medium heat until sugar completely dissolves. Split pickling liquid evenly among the two jars. Close and let cool at room temperature for an hour. Transfer to fridge until ready to use. Combine yogurt, grated cucumber, cumin, chili powder and salt in a bowl. Stir to combine. Cover and place in fridge until ready to use. Reserve mint for garnish when plating. Preheat oven to 300 degrees F. Separate cauliflower into 4 "fans" the best you can. To do this, you only need a knife to cut the base a bit, then you can break it apart with your hands. There will be some small florets that fall off and that's okay. Alternatively, you can cut the head into "steaks" by cutting 1 & 1/2 inch cross sections, if that's easier for you (but you'll probably only get three "steaks" and more loose florets this way). Sprinkle turmeric, 1 tbsp olive oil, and 1 tsp salt over cauliflower. Rub the seasoning in so that all the surfaces are lightly covered. Transfer the cauliflower to a baking dish, cover with aluminium foil and roast in oven for 2 hours, covered. Remove aluminum foil and roast for another hour, uncovered, for a total of 3 hours roasting time. While cauliflower is roasting, make the lentils. Heat up 2 tbsp olive oil in a large stainless steel skillet over medium heat. Add onions and cook, stirring frequently, for 45 minutes until the color reaches a dark golden brown and onions have caramelized. Add 1/2 tsp salt and stir to combine. Place beluga lentils, water, bay leaves, and garlic in a medium saucepan. Bring to a boil and turn down heat to medium low. Simmer, covered, for 25 minutes until lentils are tender but still have a good bite. 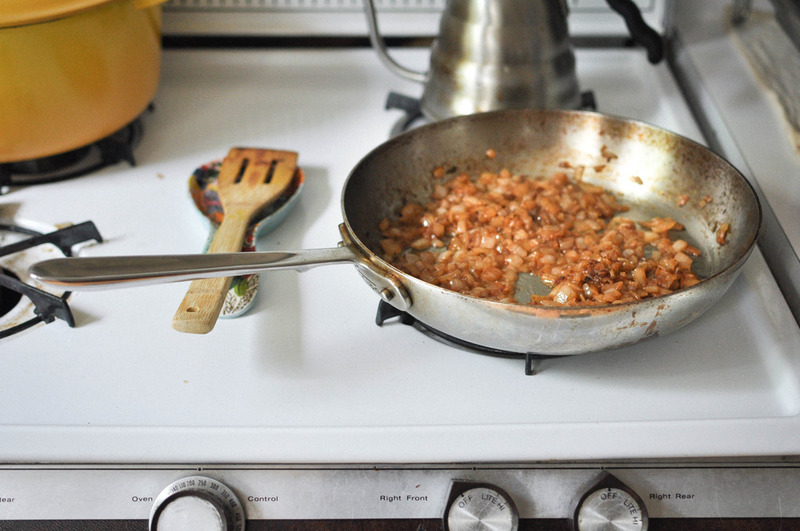 Drain and transfer to the pan with caramelized onions. Add final 1/2 tsp salt and final 1 tbsp olive oil. Stir to combine. Taste and adjust seasoning as desired. In a small stainless steel pan, toss enough pickled raisins for serving with just a dash of olive oil over high heat (you can skip this step, but I like the texture better his way than just soggy raisins). Divide beluga lentils among four plates. Divide cauliflower and place gently on top of lentils. Add a few tablespoons of raisins and mango. Drizzle a spoonful of raita on top and finish with a scattering of mint.